Have you seen the latest Modern Patchwork (March/April 2017) magazine? Back story: In my local Modern Quilt Guild we did an exchange with some gals from a traditional quilt guild about an hour away. I had written up a simple tutorial, which is what we followed. Then after the exchange my group got together, designed a layout and pieced the top together. (Designing in a group was interesting, I’d like to do that again) Once the quilt was finished, we went to their meeting, did a modern quilt presentation and shared the quilts we had sewn from each others guild. It was a blast. The quilt in the green/grey setting (in the magazine) was the first quilt. I sewed it to show what I was talking about in the tutorial. After my group got together to set the exchange blocks I wondered how many settings I could come up with myself. I sewed up 20 blocks and found 19 more settings but the blocks were getting ragged so I finally stopped. I enjoyed this all so much I decided to share and sent it in to see if they’d publish it. They did. 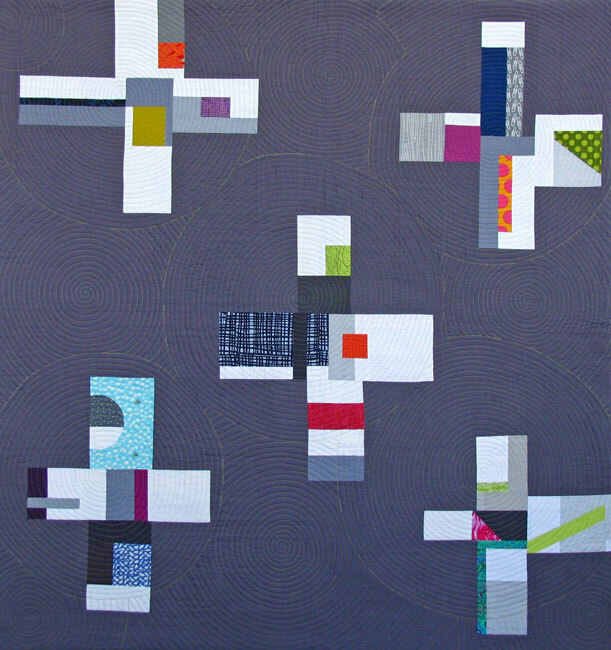 The second quilt in the magazine, the frame setting, is pieced by members of the Wenatchee guild (blocks), set together by Moses Lake Modern Quilt Guild and quilted by Charisma Horton. Love the quilts you share today! I especially like the framing strips and the circular quilting, fantastic! I love everything about you IF ONLY I didn’t live in a tiny mountain town in CA. My local guild is very lovely but mostly traditional, and focused on supporting young women’s advancement. I love this, but yearn to find people who are in my funky box. It’s so interesting to see you working with the bright modern colors and patterns. I have to say I’m really enjoying your quilts…I’m very fond of the Log Cabin look! Love the way the colors and layout work. I am going to make the newbie modern quilt blocks as shown in modern patchwork. How did you piece the green background? Your instructions don’t cover that part. Or am I misunderstanding? Hello Sue. I arranged my blocks on a design board til satisfied and took a photo to refer to. Then I measured in between the blocks and filled it all in with green. I worked on small sections at a time. Think of it as a puzzle that you need to make the pieces fit. Sorry this isn’t a specific instruction on how to do it but your blocks will be all different than mine. Good luck!